Samsung's UA46B8000 boasts a claimed 3000000:1 dynamic contrast ratio. When it comes to choosing a top-of-the-range television, you can choose between the tried-and-tested technology of plasma televisions and the newer innovations of LED-backlit LCD panels. We’ve discussed the technical differences between these television types before — but how do the premium models from each camp stack up against each other in real-world tests? We pitted Samsung’s premier Series 8 LED television, the 46in UA46B8000, against the reigning king of plasma televisions — the Pioneer KURO. We chose the 50in model of the luxury LX series to keep a level playing field, as the similar screen sizes mean picture quality differences are more apparent. 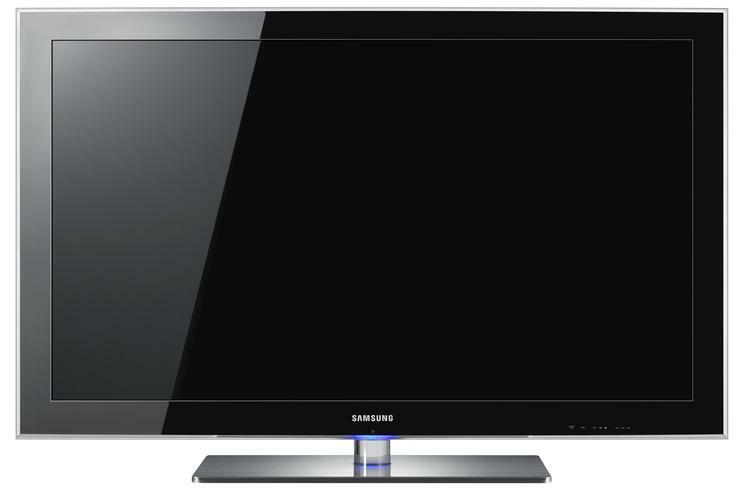 At its heart, the Samsung Series 8 (UA46B8000) is an LCD panel. But unlike "traditional" LCD TVs, which use fluorescent tubes to create a uniform backlight, it uses light emitting diodes (LEDs) positioned around the edge of the panel to provide section-specific brightness levels. Samsung claims the TV has a 3,000,000:1 contrast ratio, which is a lot of zeros! By way of comparison, Samsung's LA52A850 non-LED LCD television has a 70,000:1 contrast ratio. According to Samsung, more than 500,000 of its LED TVs were sold in Australia during the last two months. The Pioneer KURO series of plasmas have always been the televisions to beat. Their class-leading performance includes exceptional inky black levels, vibrant colours and impressive scaling technology. The KURO name is fading to black in Australia though, with Pioneer pulling out of the global television market. Although a successor to the Panasonic TH-P50G10A may eclipse it, we think the Pioneer KURO PDP-LX509A is the best plasma currently on the market. Pioneer doesn’t condescend to offer contrast ratio figures for the panel. We compared the Pioneer KURO PDP-LX509A and Samsung Series 8 (UA46B8000) on a number of points to see which came out ahead. The majority of our testing was done using a Samsung BD-P1600 Blu-ray player. This is an area we expected the Pioneer to dominate — and we weren't surprised by the results of our tests. The KURO disappears when in a dark room, with its phosphor cells unnoticeable. Combined with inky black levels even in high-contrast scenes, no brightness bleeding and huge dynamic range, the Pioneer KURO PDP-LX509A is still our benchmark for television picture quality. That’s not to say that the Samsung UA46B8000 doesn’t put up a good fight. The section-specific LED back-lighting means it can dim the screen in low brightness scenes, so video footage with bright and dark areas is displayed well. The Achilles heel of the UA46B8000, though, is backlight cloudiness in super-dark scenes. If there’s only a pin-prick of light on the screen — the light at the end of a train tunnel, for example — the LED edge-lighting shows up as slightly brighter cloudy areas around the screen’s edges. It only rears its ugly head in very specific conditions, but we think the Pioneer KURO is the winner in this area. We were hard pressed to pick one panel as better than the other when it came to picture detail and image clarity. While the Pioneer is slightly softer when displaying Blu-ray movie content, a little adjustment brings it easily up to par with the Samsung’s Movie mode settings. The Pioneer has a greater range of adjustments available — gamma, sharpness and so on — but when we calibrated both screens to what we perceived as the best picture, we were hard pressed to see a significant difference in the quality of Blu-ray video content. Put simply, both will make the most of the detail in Blu-ray content.